Water is the most essential and vital element for life. Unfortunately Dhaka, the capital of Bangladesh is the 19th megacity of the world with over 14 million population where the gap between demand for fresh water and its supply has been ever increasing. In Dhaka almost 87 per cent of the water supply comes from ground water and the remaining 13 per cent comes from surface water. 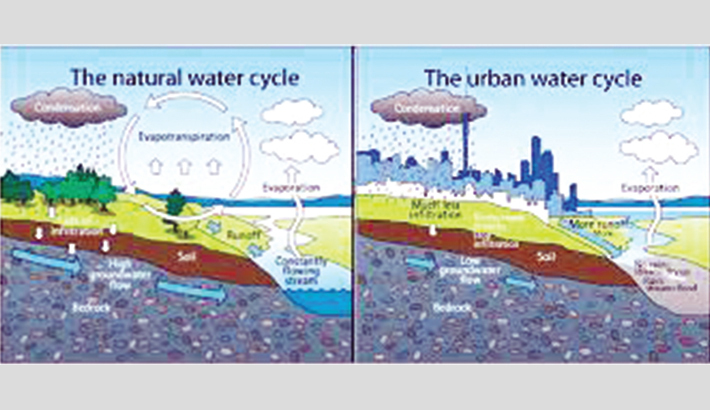 Because of huge amount of extraction of underground water the water table is declining gradually which may result in drastic incidents like Land Subsidence in Dhaka and saline water intrusion in southern part of Bangladesh. A study made by Dhaka WASA shows that the depletion rate is around 3.52 meter/year and so it is a challenge for the country to meet the current and future water demand. Rainwater harvesting can be a great source of alternative water supply in Bangladesh. The availability of fresh water during the dry season is almost an invincible challenge which can be managed by using rainwater as an alternative supply. It can offer a better solution for water supply problems in areas where there are inadequate supply of both surface water and ground water. Ground water recharge through rainwater can be done by digging wells, pits, tanks, bore wells, recharge trenches, etc. A study by BMD, over a period from 1975-2015, shows that the annual average rainfall in Dhaka city is 2150mm and the maximum average rainfall occurs during the month of July. It has been estimated by IWM that approximately 1,49,160 million litres of water can be harvested during rainy season and it can greatly reduce the dependency on ground water at least during the six months of monsoon. In the current emerging situation of water crisis in the areas where considerable rain is available, in those areas rainwater harvesting is the best option as the source of water. So, rainwater harvesting can be a permanent solution to many of the existing problems related to water. As buildings cover majority of the portion of Dhaka, hence rooftop rainwater harvesting and also the harvesting of water that is leached from the wall of the building can be initiated, provided that the design of the structures, installations, operations and maintenance are done properly. But for these the policy makers and the planners should not only remain well concerned virtually but also should act dynamically and incorporate rainwater harvesting education in the current educational system. The current educational system must try to institutionalise the knowledge of production system and mainstream rain water harvesting in the curriculum. Again there are several policies in Bangladesh regarding water and environment but there is no exclusive policy on rainwater harvesting other than a very few highlights. The water related policies in the country are: National Water Policy 1999, National Policy for Safe Water Supply and Sanitation 1998, National Environmental Policy 1992, National Forestry Policy 1994, etc. But there is no separate policy for the promotion of rainwater harvesting. Rain water harvesting is a part of integrated water resources management to mitigate the water crisis not only for Bangladesh but also for the entire world and hence it should be given priority as asset and economic good for present and future.